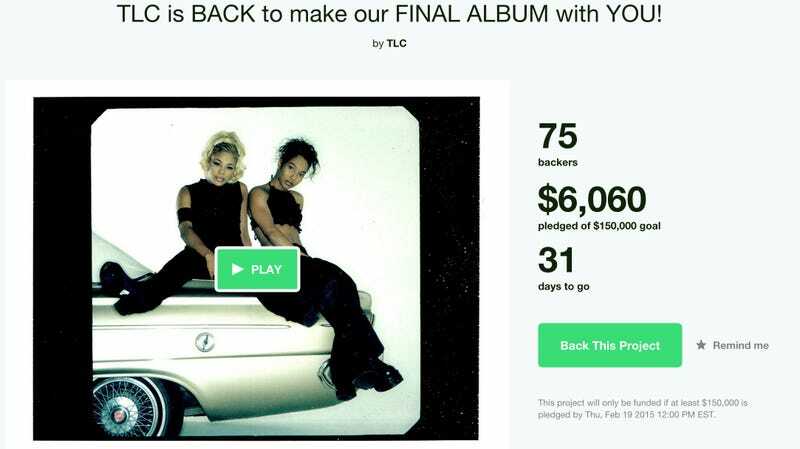 Though the news leaked Sunday, TLC has officially launched a Kickstarter to fund their final album, which they say they want to do "with YOU, our FANS (our babies!!)." No! Us?! As T-Boz and Chilli note, this FINAL album is the first studio that just the two of them will make, since the untimely death of bandmate Lisa "Left Eye" Lopes in 2002 ("Of course, Lisa's spirit will always be present in our music. That will never change," they write). Since that time, they've performed together, released best-ofs and one-offs, but in 2009 they said they were going to start working on new music. There have been rumors that this new album will include collaborations with Lady Gaga and Lil' Mama (the latter played Left Eye in the Vh1 TLC movie). In December they released a Christmas song. Why Kickstarter? Control. "While major labels offer artists multimillion dollar recording and marketing budgets, they don't often give artists complete control of their own music," the duo writes. "It is ESSENTIAL that we create our final album completely on our own terms, without any restrictions, with YOU."